1 CORINTHIANS 1:18 KJV "For the preaching of the cross is to them that perish foolishness; but unto us which are saved it is the power of God." 15Lest any should say that I had baptized in mine own name. 16And I baptized also the household of Stephanas: besides, I know not whether I baptized any other. 17For Christ sent me not to baptize, but to preach the gospel: not with wisdom of words, lest the cross of Christ should be made of none effect. 18For the preaching of the cross is to them that perish foolishness; but unto us which are saved it is the power of God. 19For it is written, I will destroy the wisdom of the wise, and will bring to nothing the understanding of the prudent. 20Where is the wise? where is the scribe? where is the disputer of this world? hath not God made foolish the wisdom of this world? 21For after that in the wisdom of God the world by wisdom knew not God, it pleased God by the foolishness of preaching to save them that believe. For the preaching of the Crosse is to them that perish, foolishnesse: but vnto vs which are saued, it is the power of God. For the word of the cross is to them that perish foolishness; but unto us who are saved it is the power of God. For the word of the cross seems foolish to those who are on the way to destruction; but to us who are on the way to salvation it is the power of God. 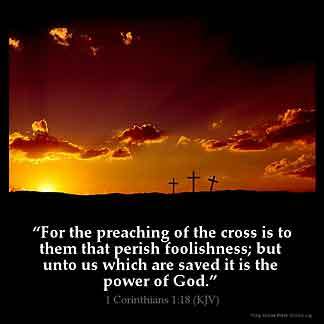 For the preaching of the cross is to them that perish, foolishness; but to us who are saved, it is the power of God. For the Message of the Cross is foolishness to those who are on the way to perdition, but it is the power of God to those whom He is saving. For the word of the cross is foolishness to those who are dying, but to us who are saved it is the power of God. For the word of the cros is foli to hem that perischen; but to hem that ben maad saaf, that is to seie, to vs, it is the vertu of God. 1:18 To them that perish - By obstinately rejecting the only name whereby they can be saved. But to us who are saved - Now saved from our sins, and in the way to everlasting salvation, it is the great instrument of the power of God. 1Co 1:18 The preaching of the cross. The gospel of a Crucified Savior. Unto them that perish. Those who are unregenerate. Foolishness. The Greek philosopher and the Jewish scribe scoffed at the thought of a Savior who had been crucified. They held that his crucifixion proved that he was not divine. Unto us who are saved. There are two sections of mankind--the unsaved and the saved. To the first, the cross is folly; to the second, the gospel of the Crucified One comes as the "power of God". See Ro 1:16. To the unsaved, the cross is a pillar of cloud; to the saved, a pillar of light. I think that people really don 't understand what Jesus who is the almighty God did on Calvery 's cross for them, He who had no sin loved humanity so much died for us so that we can obtain eternal life through him..people in the world need to take advantage of salvation, We can have a better world if we get rid of sin and it 's only through Christ Jesus. How heavy that cross was showing how heavy our sins were on just one man the man that at the end proved to be the only way by which man could have a relationship with God by dying on the cross and giving his life a ransom for many then three days later rose from the dead and gave way for the Holy spirit, the Counselor, to guide us into all truth. Truly to those who are being saved it is the power of God! It is absolutely true that who never faced difficulty in life will say that but those who have seen and receive protection they know exactly the power of the cross. It is sad that people that profess that they are a Christian do not know of the reality of the cross of Jesus Christ. Truly the cross of Christ is the power of God unto salvation to all that believe and I believe !!!! I kneel at the cross much I would rather be a fool for God than a fool for the devil and his crowd.